Springtime has many of our woodlands fragranced by the sweet scent of wild bluebells. These delicate, bell-shaped flowers form seas of vivid blue over woodland glades and are a joy to behold, heralding the arrival of nature’s busiest season. Follow the meandering paths through the Great North Wood at Buckland Abbey and discover the blanket of bluebells that grow beneath the trunks and boughs of this ancient site. During springtime, the old monks’ route known as ‘Cot Lane’ is adorned by wild flowers, and here you’ll be walking in the footsteps of Sir Francis Drake himself. Dogs are welcome on all of the Buckland Abbey walks, but the estate respectfully asks that you keep your four-legged friends on leads in areas where there is livestock. Enjoy the tranquillity of this countryside idyll, and keep your eyes peeled for deer, birds of prey, and on the rare occasion, otters. Beneath the conifers on Killerton Estate are dazzling ensembles of spring flowers, including hundreds of wild bluebells. You’ll also be beguiled by the magnificent purple groundcover of cyclamen beneath the ancient and gnarled trunks of the mighty sweet chestnuts on The Chapel grounds, where the rooks are building their nests. Dane’s wood, named after the Danish raids of the tenth century, is a sanctuary for the beloved bluebell and perfect for a gentle dog walk, as is the Ashclyst Forest and the south facing slopes of ‘the Clump’ and the rolling hillside ‘Plains’. Every year, Wembury Woods plays host to masses of gorgeous, wild bluebells. Follow the hilly paths and woodsman’s trails through this beautiful corner of the South Ham’s countryside and enjoy stunning views of the Yealm River as it wends its way from the Salt Moor mires of South Dartmoor before reaching the tranquil estuary waters on the western banks of Wembury village and the waterfronts of Newton Ferrers and Noss Mayo. The gardens at Godolphin are widely considered to be among the most admired in Europe. The wider estate has reclaimed its natural state after years of mining activity, and during the months of April and May the rolling hills become carpeted by magnificent wild bluebells. The Godolphin bluebell festival is an annual celebration where you can come and learn more about this much-loved wild flower whilst enjoying a guided bluebell walk along the paths of Godolphin Woods. Kingfishers, otters and dippers, just some of the extraordinary wildlife that inhabits the Lanhydrock estate. Follow the River Fowey through ancient woodland along paths edged by wild bluebells. To celebrate the arrival of the woodland bluebell – known in folklore as ‘the fairy flower’ – Lanhydrock will be organising a guided walk followed by lunch in ‘The Stables’ restaurant. Explore the grounds of this lavish family home built in the style of an Italian palace. Discover the elegant Japanese Garden and sheltered walks through the surrounding woodland where the bluebells have emerged to blanket the sunlight-dappled floor. Kingston Lacy is also occupied by the remnants of Iron Age forts, heathland and water meadows, and the remains of a Roman road, all part of this historic and captivating 8,500 acre estate. Thorncombe Woods lies next to Hardy’s Cottage; the cob and thatch dwelling where English poet and novelist, Thomas Hardy, was born. These gorgeous woodlands cover 26-hectares with gnarled, old oaks, spectacular sweet chestnuts and leafy beech trees, and is also sanctuary for the much-loved dormouse. Springtime is a particularly special season in Thorncombe Woods, when the bluebells burst into life and carpet the woodland floor with their pretty hoods and drooping heads. 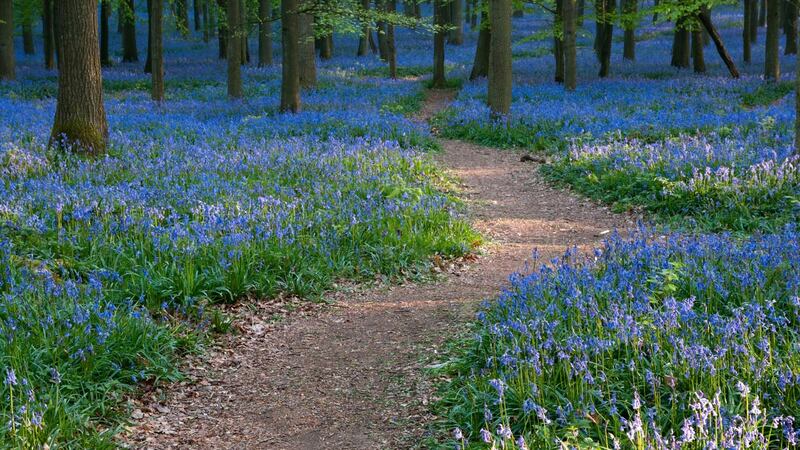 Come and enjoy beautiful bluebell woods when you book a springtime holiday with Toad Hall Cottages.